Happy Kitchen Sink Stamps Monday, thanks for stopping by! The weather is supposed to be near 80 degrees by the end of the week, and I can't wait! My Lilac bushes have little buds, and I'm looking forward tothem opening and being as beautiful as the Multi Step Lilacs below! The colorful background on my card was created using the Gilmmer Mist Watercolors Technique from the April Technique Junkies Newsletter. 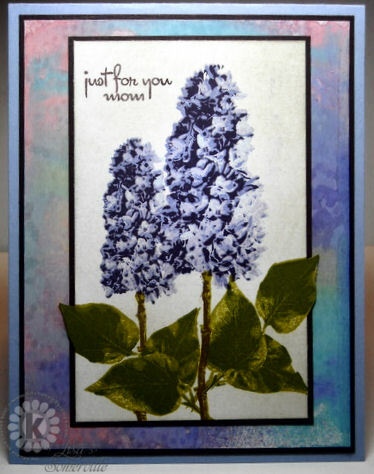 The Kitchen Sink Stamps Multi Step Lilacs were stamped in shades of Purple, then cut out using the Out of the Box Technique. The sentiment is from Kitchen Sink Stamps Ready 4 Any Holiday. A perfect card for Mother's Day, don't you think? I am so in love with the lilacs! What a sensational card, Lisa!! Lisa! Your lilacs are just beautiful, love how you have the leaves going off the main panel! Wonderful!! Just beautiful, Lisa!! I LOVE your color combo of the lilacs! The background looks so awesome. I love it!